At Cannon School, teachers are committed to looking for new ways to facilitate learning. 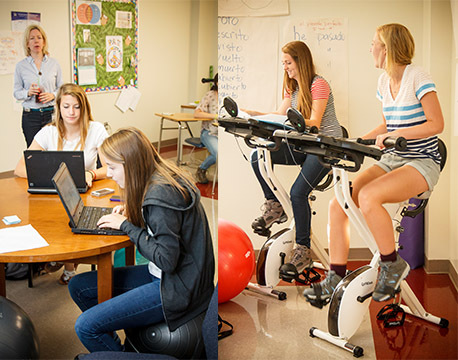 Dr. Michelle Donah, Upper School Spanish teacher and chair of Cannon’s World Languages department, has added “FitDesks” to the mix in her classroom this year. In the post below, two upper school students share their thoughts on how Dr. Donah’s emphasis on fitness impacts them as learners. In Dr. Donah’s active Spanish classes, not only do we get a beneficial learning experience, but as students we get the an opportunity to stay fit. It is proven that exercising while doing academic work improves mental capacity and attention span. Every student in our class finds this new way of learning intriguing and is curious as to where it will take us. Students study and exercise in Dr. Donah’s classroom. There cannot be a better, more energetic teacher than Dr. Donah to explore this new way of teaching. In her classroom, bikes called “FitDesks” and plenty of yoga balls are provided for students to test the theory that students learn better when not sitting in a standard desk. We are also given the opportunity to get up and move around during long block classes with walks around campus. On these walks, we talk in Spanish, count, or just get to know each other better. In Dr. Donah’s classroom, students feel comfortable in exploring their own personal ways of learning. She demonstrates a concern for our personal health and our independent studies. When students walk into this different type of learning environment, they know it is a safe place to learn and ask questions. When students leave Dr. Donah’s active classroom, they leave feeling refreshed, re-energized, and ready to focus in their upcoming classes. Being in Dr. Donah’s class is so much fun! We could not have asked for a better teacher.